As a city, Boston has just about everything you could want—shopping, museums, nightlife, restaurants. But from time to time, we all need a change of scene away from the subway tunnels, skyscrapers and throngs of people around Fenway Park and Newbury Street. When that time comes, there’s no better cure than a trip to the North Shore, a cluster of communities lining the coast between Boston and New Hampshire. Visitors can take advantage of miles of stunning coastline, quaint fishing ports and seafood restaurants that rival Boston’s in quality (but minus the stuffy atmosphere), as well as enough historical attractions and activities to please both youngsters and adults alike. Thanks to the fabled Salem Witch Trials of 1692, Salem forever sealed its identity as The Witch City. The events actually took place in what is now the adjoining town of Danvers, but countless books, plays and films have revisited the hysteria that erupted and which led to the executions of 19 people. Although a sad chapter in Colonial history, Salem has exploited the more popular, fictional images of witches and their potential kitsch value. Visitors can delight in what feels like a year-long Halloween party or delve into the mysteries of the occult at area shops. Just this spring, Salem residents were divided when cable network TV Land sought to erect a statue of Elizabeth Montgomery (Samantha from “Bewitched”) in a public square. Despite some controversy, permission was eventually granted, and the statue now stands in Lappin Park. Fortunately, the city is also full of witch-related attractions that are historically accurate. The Salem Witch Museum pays homage to the city’s tragic past, exploring the myths and startling truths about the trials. There’s also the Witch Dungeon Museum (16 Lynde St., 978-741-3570), offering a live reenactment of a witch trial adapted from the 1692 historical transcripts. The maritime history of Salem plays the largest role in how the area looks today and is an excellent antidote to Salem’s witch obsession. The Salem Maritime National Historic Site (174 Derby St., 978-740-1660) explores Salem’s legacy as a center of merchant shipping and how the ocean helped shape the town’s destiny. Pickering Wharf (23 Congress St., 978-740-6990) remains a center of activity and home to village shops and waterfront restaurants. Schooner cruises depart from the marina throughout the day (978-526-7839), including a 90-minute Children’s Pirate Cruise, departing on July 24 (978-729-7600), giving your youngster a chance to live the life of a seafaring bandit, and acting as a companion activity to a trip through the New England Pirate Museum (274 Derby St., 978-741-2800). The House of Seven Gables (54 Turner St., 978-744-0991), made famous in Nathaniel Hawthorne’s homonymous book, showcases 330 years of Salem’s history in its museum and historic buildings. The Gables, Hawthorne’s boyhood home, is a National Historic District, boasting a spectacular seaside garden and is the oldest surviving 17th century wooden mansion in New England. Throughout this month, the Gables is celebrating Hawthorne’s 200th birthday with various special events. Another historic home, the Stephen Phillips Trust House (34 Chestnut St., 978-744-0440), conducts daily tours that allow visitors a glimpse into the everyday lives of servants and masters in the early 1900s. 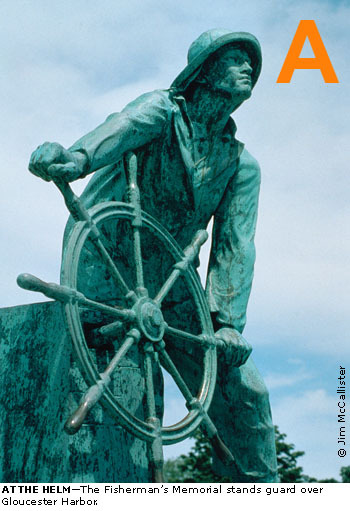 Proudly known as America’s oldest seaport, fishing has been Gloucester’s leading industry since 1623. Home to one of the last surviving commercial fishing fleets in New England, this is a working city first. 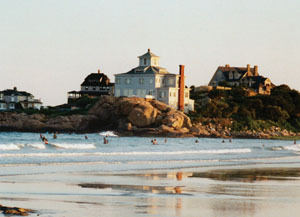 Situated on Cape Ann, Gloucester also boasts some of the North Shore’s prettiest beaches (see sidebar, opposite page). One of the closest northern beach getaways for Bostonians can be found at Revere Beach (Revere Beach Boulevard, 617-727-4708, accessible by the MBTA Blue Line from Government Center), the oldest public beach in America (circa 1896). Once a resort destination, brimming with amusement park rides and seaside hotels, the area is now best known for the legendary Kelly’s Roast Beef. But the beach and its well-fed seagulls are still there, and lifeguards are on duty all summer. For something more picturesque (we’re talking wide, white sand beaches and cool blue ocean surf), head to Cape Ann and points further north. Crane Beach (Argilla Road, 978-356-4354) in Ipswich features a gorgeous, four-mile stretch of rolling dunes, a modern refreshment stand and an incomparable view. Plum Island (978-465-5753) in Newburyport is located on a National Wildlife Refuge and boasts hiking trails, six-and-a-half miles of beachfront and birdwatching opportunities. Gloucester’s Good Harbor Beach, pictured above, (Thatcher Road, 978-281-9790) boasts a large offshore island that you can walk to during low tide, while Wingaersheek Beach (Atlantic Street, 978-281-9790), also in Gloucester, boasts climbing rocks and tide pools, both popular with kids. The unique Singing Beach (Masconomo Street, 979-526-2000) in Manchester-by-the-Sea takes its moniker from the squeaking sound created by beachgoers walking across its squishy sand. Gloucester’s fishermen will gladly bring guests along on deep-sea fishing excursions. There are countless companies that provide such trips, including Anne Rowe Charters (located on Seven Seas Wharf by Schooner Sails, 978-283-2046). The trips can be pricey and depart early (from 5–7 a.m.), but offer up to six hours of fishing for cod and haddock. Though it is miles away from Boston’s Theatre District, there are plenty of North Shore thespians treading the boards in Gloucester. Beginning July 21, Gloucester Stage Company (267 East Main St., 978-281-4433) presents artistic director Israel Horovitz’s My Old Lady. Meanwhile, the popular tourist attraction Hammond Castle (80 Hesperus Ave., 978-283-2080)—a medieval-style castle built in the 1920s by inventor John Hays Hammond, Jr.—hosts Renaissance enthusiasts from Boston and beyond on July 23 & 24 for the Robin Hood Festival, an interactive theater festival. 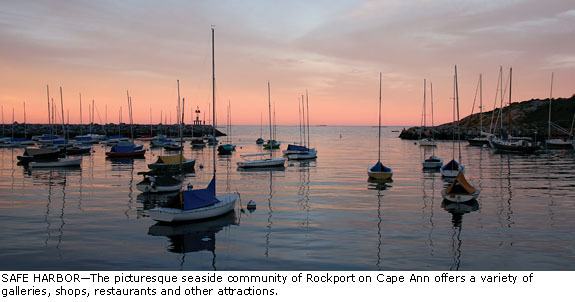 Rockport’s picturesque waterfront and numerous galleries are the perfect setting for a retreat from the city. The town can feel like a step back to simpler times, while at the same time catering to the summer swell of out-of-towners. Rockport has long been a favorite hangout of photographers, painters, jewelry designers and sculptors, and throughout Rockport, locally and nationally celebrated art is displayed at more than two dozen galleries and art houses. The Rockport Art Association (12 Main St., 978-546-6604) sponsors special events, exhibitions and shows and is open daily year-round. Halibut Point State Park (Gott Avenue, 978-546-2997), to the north of town, protects the natural beauty that surrounds Rockport. It has a staffed visitor center and several walking trails to enjoy the tidal pools, water-filled quarries and rocky coastline. Located in the heart of the North Shore, Ipswich boasts a diverse landscape that includes the Ipswich River, which runs right through town and empties into the ocean—perfect for a leisurely canoe trip. Ipswich has many beautiful spots for hiking and bird watching. Willowdale State Forest (Topsfield Road, 978-887-5931) and the Ipswich River Wildlife Sanctuary (87 Perkins Row, Topsfield, 978-887-9264) both offer great wilderness escapes for experienced and novice outdoorsmen alike. Ipswich is famous for its shellfish and The Clam Box (246 High St., 978-356-9707) has served up some of the best New England has to offer for more than 60 years, propelling itself to local landmark status. Another Ipswich mainstay, the 1640 Hart House (51 Linebrook Rd., 978-356-1640), was built just 20 years after the Pilgrims first landed, and features fine dining in a quaint, Colonial atmosphere.